It's back! Choose your favorite Glitter Heat Transfer Vinyl on sale for $4.99 (Retail $14.99). Add some bling to your designs to stand out from the rest with this high-quality glitter heat transfer vinyl. With this vinyl, you will get all the sparkle without all the shedding of glitter flakes on your hands! This is great for kids! We have 21 great colors to choose from! Buy in bundles of 7, buy unlimited bundles! This deal is for one glitter vinyl sheet measuring 20″ x 12″. This vinyl works great with Cameo, Silhouette, Cricut, Brother and other vinyl cutting machines. 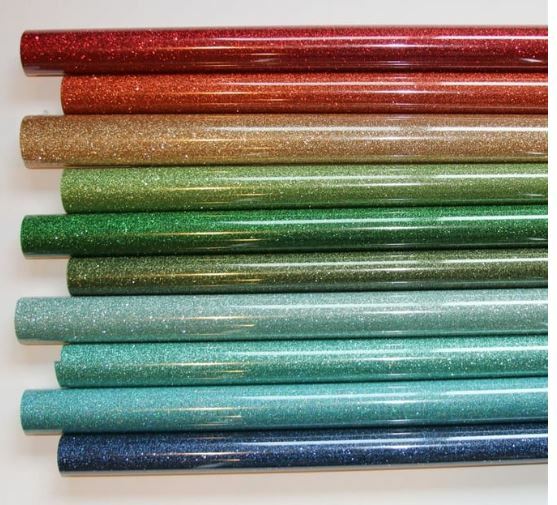 This is the glitter that we use on the products we ship to customers every day! Get a great sampling of all of our colors! Easy to cut and weed. Test cutting is recommended. Silhouette Cameo blade is recommended at blade 3, speed at 5, pressure at 33.